Epstein was co-chair of Trump’s Michigan campaign for the presidency, and her website describes her as “Leader. Businesswoman. 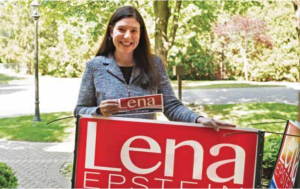 Conservative Outsider.” Initially a candidate for Senate who intended to challenge incumbent Debbi Stabenow, she switched races to compete in the primary for the Republican line on the ballot for Congress. Joan Roth spoke with Epstein, 36, at her residence in the Detroit suburb of Bloomfield. “This is a very special room in the home,” noted Epstein, who is an accomplished pianist. “My husband and I were married in this room. The photographs around the room tell a lot of our story. This room is very sacred. “I am the only Republican woman running in the midterm. I am a young mom and I am a very proud Jewish woman. My story is so unique. I come from a long line of loving Jewish Democrats. I am the first in my family to be a Republican. I am running for congress in Michigan’s 11th congressional district. And I’m going to win. “I hosted Ivanka at a women’s breakfast. I was very touched by her softspoken brilliance. The scale of my business is much smaller than the Trump dynasty.” Epstein, co-owner of Vesco Oil, a Michigan-based distributor of automotive and industrial lubricants, continued. “We’re both wives and mothers and we love the Jewish community, we both love Donald Trump. We are both East Coast college graduates, and her husband, Jared Kushner, was in my class at Harvard. Small world. “I am a very religious person. I am guided by my relationship to God. That may anger some of your readers or turn some of your readers off. I accept that. I am deeply spiritual. “I would like to chair the Jewish caucus [in Congress] and advance our shared agenda—to grow the relationship between Israel and the United States to keep Israel safe and to keep us safe and to have the most profoundly exciting economy where… people and businesses want to come back. And I look forward to advancing that agenda on the part of all Americans. “I am humbled to be part of this nation. To read the document that our founders wrote. To be able to connect with the beauty of our very, very young nation. Israel and the U.S. are both very, very young nations. “We are all immigrants. Our country is still so young, and that’s likely why you asked [about immigrants]. My family followed the path to legal citizenship. That was a beautiful path. Every day on the trail when I am knocking on doors in the district, when I am listening to my future constituents, they want to talk about how their ancestors came to this country. I want to support that beautiful path to citizenship. Again being very true to myself: I do not encourage amnesty. I will support the path to legal citizenship. She is a disgrace for having a defrocked Jews for Jesus at her rally after the shooting at the Pittsburgh synagogue. How can anybody be that tone deaf or ignorant at a time like that.